Don't get confused when you're looking at the Caravan Classic 10' x 20' Canopy with Professional Top. Just because it's a classic doesn't mean that there's anything boring or second-rate about this shelter. In fact, this outdoor tent is a classic because so many people for so many years have depended on the convenient, durable design elements and quality construction it brings to any outdoor event. Most outdoor shoppers are familiar with Caravan as a provider of quality outdoor shelters of every variety. This tent in particular is an excellent reflection of exactly what that means. The six-legged design begins with an enhanced steel frame that is durable, rust-resistant, and incredibly easy to set up or take down. The professional-grade 500 denier polyester top resists wind and UV protected while celebrating. Each of the five available height settings represents an opportunity to customize your tent to each gathering, and the highest setting offers an industry-leading 7 feet of clearance beneath the shelter's top. The 'classic' designation clearly isn't a bad thing in this instance. It's an endorsement of a level of function and an attention to detail that has made this one of the most popular styles of outdoor tents available from this or any other manufacturer. So consider the quality of the materials, consider the convenience and function of the patented design, and consider the range of conditions for which this product is perfectly suited. When you take all of those things into account, you may very well come to the same conclusion that hundreds of thousands of other satisfied owners have come to: that the Caravan Classic 10' x 20' Canopy with Professional Top is the best mix of form, function, and value going for people planning any outdoor gathering. 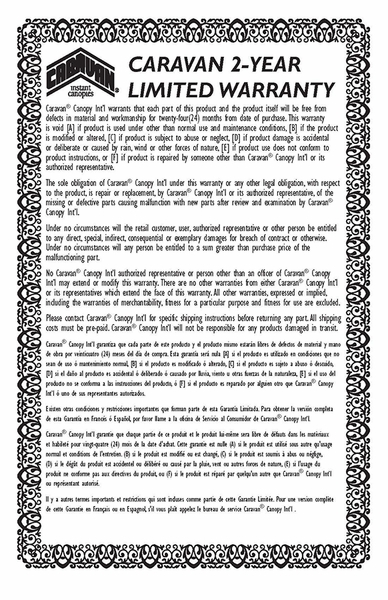 WARNING: This product can expose you to chemicals including Diethylhexyl Phthalate, which is known to the State of California to cause cancer, birth defects, or other reproductive harm. For more information go to www.P65Warnings.ca.gov. Folded Size: 62" x 8.5" x 15.5"
Comes with Stake and Rope kit and Professional 500D Polyester top. 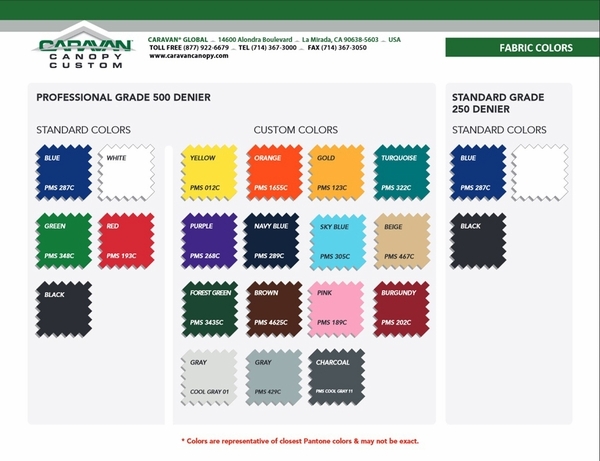 Custom Colors Available in Gold, Black, Navy Blue, Turquoise, Orange, Grey, Yellow, Purple, Pink, Brown, Burgundy, Forest Green, Sky Blue, or Beige. There will be an additional charge for these custom colors. Please allow an additional 2-3 business days for custom orders. Can I purchase just a replacement top? Yes, we do carry the Caravan 10 x 20 replacement tops. Does this canopy come with a bag? No, it does not. It will need to be purchased separately and can be found on the accessories tab of the item page. I need to replace a piece that broke. How do I know what to order if I lost the sheet that came with the tent? Please see our Caravan Classic Canopy Replacement Parts Guide. These parts will fit only the Caravan Classic frame. Out of the box easy to set up and take down. Everyone liked it and wanted to know where I got it. I got the professional canopy in orange which stood out and got us notice. ConsShould come with the rolling bag carry bag. Just what we needed. Easy setup & very solid. Great for our intended (tailgating) purpose. The right balance between weight & sturdiness. Any heavier & it would be too difficult to manage. It really shouldn't be sold w/ out the wheeled bag. ProsStrong, clicks in easily when going up, easy-pull ergonomic pins for take down. Covers an entire parking spot. ConsDon't even considering going w/ out the wheeled bag. I like the canopy; it is easy to put up. It appears to be made well and should;d last a long time. ProsAttractive canopy that is well built and easy to put up. ConsThe expensive but low quality roller bag. 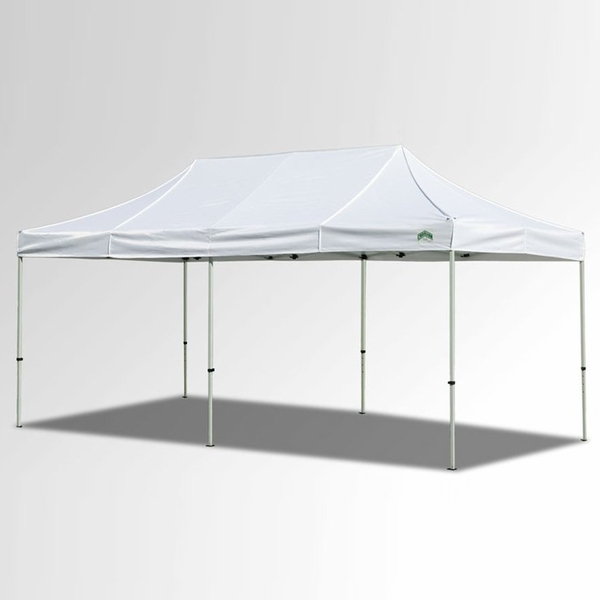 It is a heavy-duty canopy that just right for everyday events. Very heavy, so just be careful when you carry. Easy to set-up, 1st time about 4 minutes. ProsEasy to set-up, high grade material. I have bought Caravan Canopies before and I love the quality of the items.I bought 2 -10x20 professional top canopies.The tops are orange and really stand out nicely. I love the tents they look absolutely wonderful. I wish they came standard with rolling bags for the large price of the tent because the tents with the tops weigh over 100lbs. ProsDurable and quite easy for two people to handle together. ConsShould have come with rolling bags to make them easier to handle because they are heavy. Great product, very sturdy, very Sharp looking. Fairly heavy, especially for the bag it came.